The sewn flag is the most traditional method of manufacture and in many respects it is still the most effective. But even the most traditional methods can be splashed with innovation. J.W. Plant excel in such innovative techniques by combining state of the art digital reproduction with traditional appliqué to stunning effect. The sewn flag is the most traditional method of manufacture and in many respects it is still the most effective. Individual pieces of cloth are cut to the required shape and size, and they are joined by using a felled seam. A felled seam is used to turn the material in on itself, interlocking the raw edges. It ensures that the first row of stitching is trapped within the seam and the two layers of material pull in the same direction. This seam construction protects the material yarn from the elements, enhancing their strength and durability. The flag design would usually have its design appliquéd into position on the background material. Appliqué is the process whereby layers of design material are built up onto the field of the flag. The individual colour elements of the design are fixed in place using a zigzag stitch and the excess material is cut away. The openness of the appliqué stitch can be varied, producing a range of outline strengths. The correct choice and combination of the base material is essential to the strength and overall performance of the flag. As a standard, J W Plant uses a 160gsm woven polyester for the background colour and 110gsm 3 bar knitted polyester material for our design work. The use of poly-cotton threads in our appliqué, and bonded nylon threads in the hems, we ensure that the performance and durability of our flags are not compromised. Each hem has a minimum of two rows of stitching, this increases depending on the flag size, with additional rows being added to the fly of the flag. All corners are box stitched, ends are back stitched, and there are 8-10 stitches per inch, per row, per hem. All materials and finishing are carried out in accordance with MOD specifications UK/SC/5551. 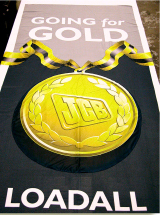 By remaining at the forefront of technological developments, JW Plant has strengthened its ability to produce high quality sewn flags. Digitised patterns ensure that designs are more accurately transferred to the flag medium; and digital print has advanced illustrative badges on national flags and the reproduction of logos on corporate flags. The combination of traditional appliqué techiques with cutting- edge computer graphics can be harnessed with stunning effect. It is in this area that JW Plant excel.